Last week we went to Ikea's Xmas party to celebrate St Lucia in true Scandinavian style. The kids had a ball as always, as they danced round the tree, in a way you just don't in Scotland - our trees tend to be found in the corners of rooms or against a window with no room to dance at all. We try to attend it every year, in a vague attempt at Scandinavianizing our Xmas! At the weekend Charlotte helped the little ones make Danish Xmas biscuits. After all she has been part Danish since she was just six years old. 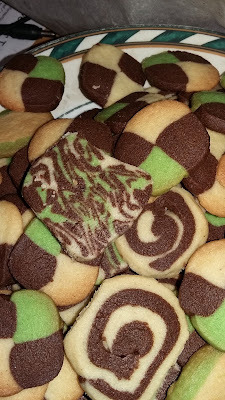 She's even introduced her own personal touch (coconut pandan from the Chinese supermarket) and that has added a streak of green through everything. But it is weird really, when you consider that this is our tenth Xmas as part of a Danish family, and we have never spent Xmas in Denmark. Thomas's parents don't tend to spend Xmas there so there's no home base to return to. Thomas does his best to tell us of their traditions and we do our version: we bake the cookies, we make gingerbread houses, the kids make Scandinavian decorations for our tree. The kids watch their daily episodes of their own imported Julekalender DVDs and have hand-wrapped gifts every day unlike their classmates whole tend to have a chocolate calendar. 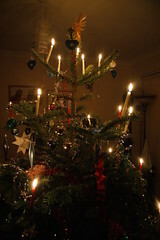 We have real candles on our real tree while all the neighbours cower in terror at the thought of naked flames on a tree. We have no Santa and we give our gifts on the 24th, not the 25th. The children have always known there's no Santa so spend their childhood keeping their guilty secret from schoolmates, neighbours and even the cousins they see on Xmas day. Their eyes twinkle when they greet them with the question: What did Santa bring you? and they play along, knowingly. In fact we sleep late on Xmas morning when every other house in the street has been up and bouncing since the wee small hours. Half tenish is a normal enough time for us to stir on Xmas morning and that is a whole lot more civilized than the 5ams my friends report! We force down the obligatory herring and rye bread with Schnapps for lunch on the 24th, because Thomas assures us that's what we're meant to do, though only so we can secretly get to the duck as that tastes a whole lot better! But is that what Scandinavian Xmas is like? I don't really know because I've never tried it. All dreams of a log cabin in the snow are just that - only dreams. I wonder if he has managed to make it real enough for the kids to carry these traditions on into their families when they are older or if the fact that we never made it to Denmark during their childhood will eventually lead to them losing that connection? It would be a real shame given the huge effort Thomas has put in over the years, but will they manage to connect it to their roots in a country they sadly rarely visit or will they simply see our traditions as one family's idiosyncrasies? Why do we buy presents?